In the coming decades, utility-scale solar developments in the Mojave and Sonoran deserts of California will significantly impact special status species and radically alter ecosystems. Potential mitigation measures that address impacts to special status plants may include permanent protection of offsite target populations, translocation of existing plants to an offsite location, plant salvage, and mitigation seed banking. Successful implementation of these measures and the restoration of impacted populations require managers and policy makers to have taxon-specific information on the population biology of rare species, including evidence on the growth or decline of subpopulations. Our 4 year study, funded by a grant from the California Energy Commission to BMP Ecosciences, will provide detailed information on the population and reproductive biology of a suite of such rare plants. 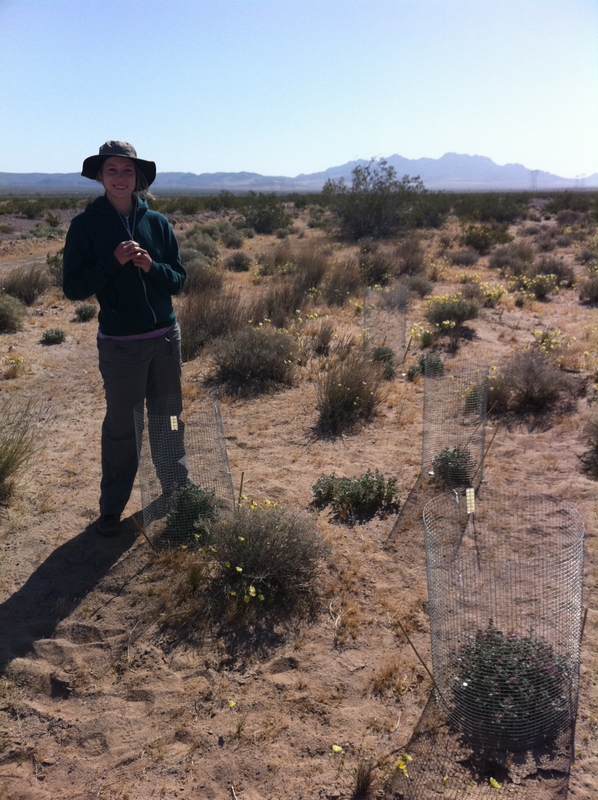 In 2010 and 2011 we initiated studies on the population dynamics of nine rare plant species that are representative of the life forms and phenologies of plants in the Mojave and Sonoran Deserts and of plants that are either currently impacted or likely to be impacted by renewable energy development. We have designed studies on each species to evaluate their population dynamics (emergence, survival, growth, and reproductive rates), species-specific constraints on reproduction and growth (ex. herbivory, pollinator limitation), and germination/seed dormancy. Demographic responses to herbivory and drought frequency – Using experiments and population projection models on the rare perennial Penstemon albomarginatus (White-margin beardtongue), we have found that herbivory and drought reduce the population growth rate through their impact on survivorship of large plants and increased drought frequency predicted by climate models leads to extirpation of this species in CA (Moore et al. In prep). This project is in collaboration with James Andre, at Sweeney Granite Mountain Desert Research Station, who observed survival rates at nine subpopulations of P. albomarginatus from 1994-2003. A similar demographic study using additional monitoring data collected by Joshua Tree National Park is underway on P. thurberi (Thurber’s beardtongue). Experimental shading of annual plant communities – Comparative shade treatments to determine the effects of solar panel shade on annual plant communities dominated by Eriophyllum mohavense (Barstow woolly sunflower) and its common congener E. wallacei (Wallace’s woolly sunflower). This project is led by post-bacc Karen Tanner. Through this study, we will gain understanding of the effects of shading on temperature, moisture, and light regime and the cascading effects that shading has on the focal species and their communities over time. Preliminary results show that panels lower day time high temperatures by over 7 C and increase night low temperatures by about 2 C. Shading also has consistent negative effects on diversity and target species performance. Energy development as an experiment – We are comparing the effects of “treatments” within the Ivanpah Solar Electric facility, its mitigation sites, and natural populations of the rare cactus Grusonia parishii (Parish’s club cholla) and rare milkweed Asclepias nyctaginafolia (Mohave milkweed) on the vegetative and sexual reproduction of individuals and vertebrate and non-vertebrate herbivory. We will use models to compare and project the effects of management strategies on the growth and reproduction of populations over time. Preliminary results show that transplanted milkweed plants have lower rates of fruiting than naturally occurring emergents. We have also observed wild annual fluctuations in rare plant population densities between 2011 and 2012 (Mimulus mohavensis, Mentzelia tridentata, and Eriophyllum mohavensis) across these species’ ranges. In 2012 we initiated a region-wide study on the dioecious relic shrub Castela emoryi (Crucifixion thorn). We have plans to add a conservation genetics component to this study in 2014.